Yea ds are common in soil and on decay fruits. Yeasts are found in ails substrates which are rich in sugary substance. Yeast has great industrial importance. They are used in fermentation of sugar into alcohol. Yeasts are extensively used in bakeries and breweries. S’acc haromyces cerevisiae is commonly used yeast. Yeats extract is commercially used for vitamins synthesis. Yeasts are unicellular non-hypha fungi. Tk shape of their cell is oval. It has well developed chitinous \N all The cell has granular cytoplasm. It contains large vacuole. Cytop! : sm is differentiated into ectollasm and endoplasm. A small nucleus ,s present on on .! side of the vacuole. Sometimes. yeasts attach with each other. They form falst mycelium or pseudomycelium. Yeasts cells form slimy colonies. The color of the colony is white, cream or light brown. Yea.ds are heterotrophic. They are mainly saprophytes. They live in sugary substances. 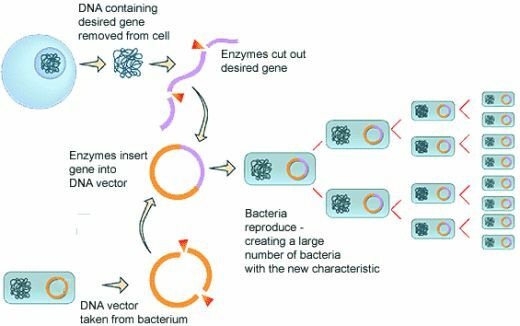 Yeasts release enzymes in the substrate. These enz; mes are invertase and zymase. They changes sugar into alcohol. Budding: SaccharomYces reproduce asexually by budding. Thus it is also called budding yeast. A small protuberance is produced on the cell. This protuberance increases in size. The parent endoplasm moves into it. The nucleus of parent cell divides into two. One daughter nuclei migrates into the bud. Bud is separated “rom the parent cell. This bud increases in size and it becomes new yeast cell. Sometimes, bud may produce another bud. The new bud again forms new bud. This process continues and a chain of buds are formed. 2. 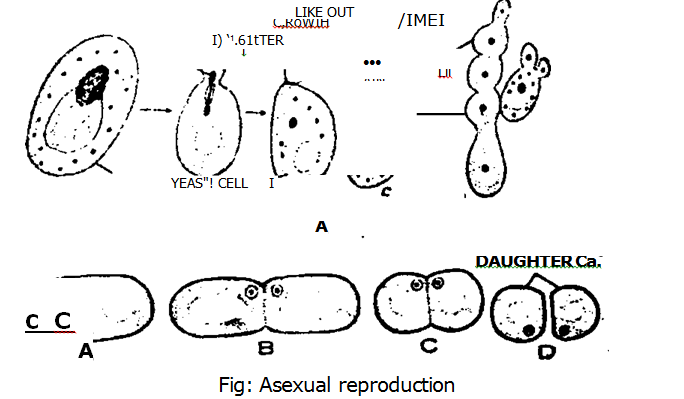 Fission: Some yeasts reproduce asexually by fission. The vegetative cell elongates. Its nucleus divides into two. A cross wall divides the cell into two. Two haploid vegetative cells fuse during sexual reproduction. They font diploid cell. Diploid cell is larger than haploid cells. 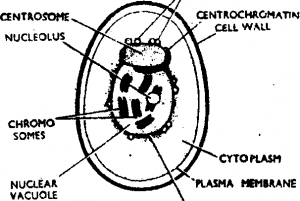 This cell can reproduce asexually by budding. Thus a generation of diploid cells is produced. 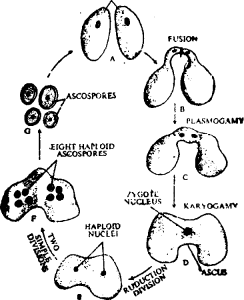 Ascus and Ascospore formation: The diploid cell changes into ascus. 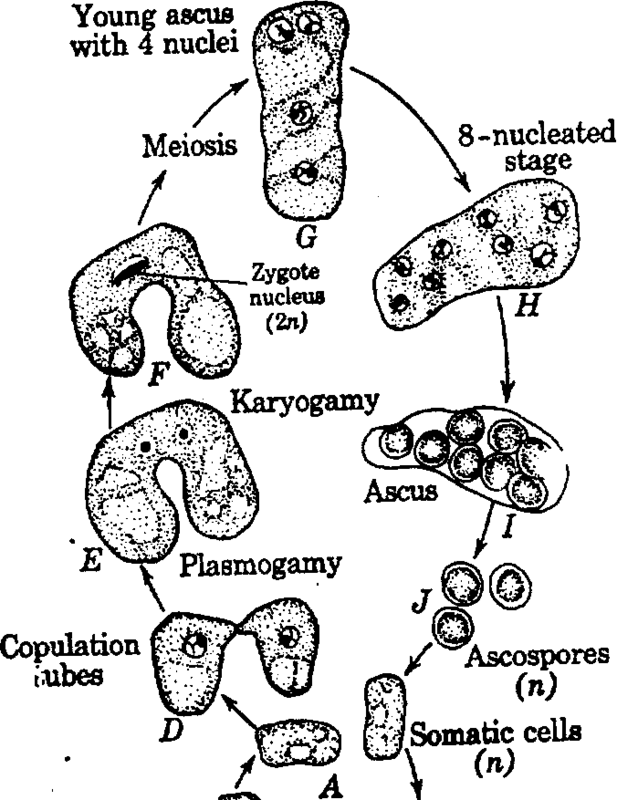 The nucleus of ascus undergoes meiosis. It produ:es four nuclei. 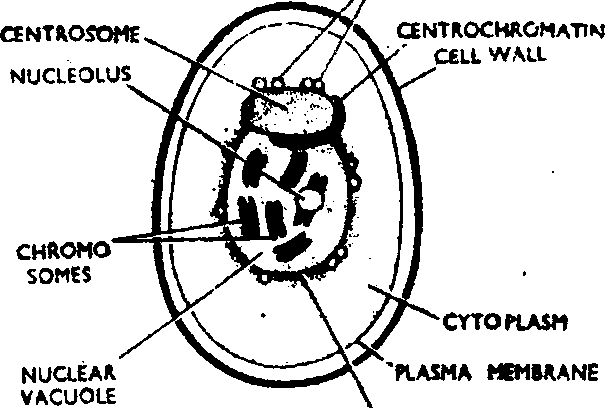 Each nucleus is surrounded by protoplast. It is changed into ascc spores. 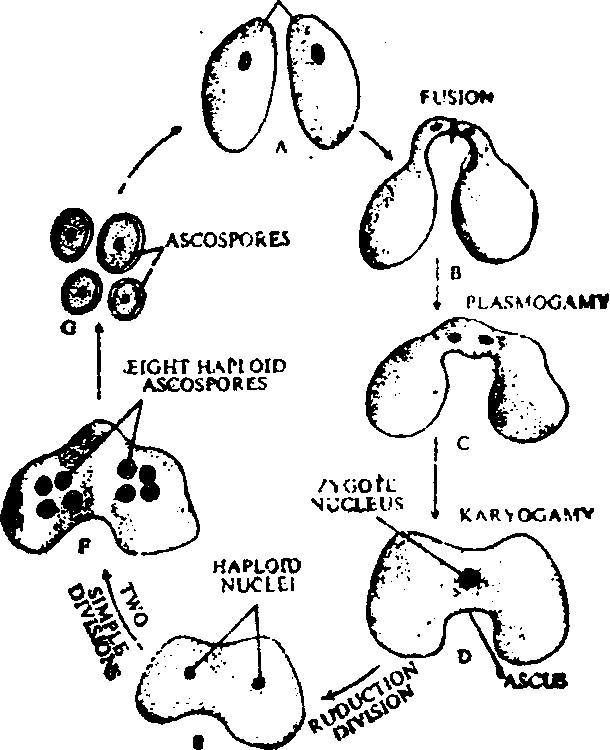 Thus four haploid ascospores are formed inside the ascvs. In some yeast. ascospores divide mitotically and eight asccspores are formed. The ascus wall ruptures. It release ascc spores. Germination of ascospore: Each ascospore acts as vegetative cell. It reproduces asexually by budding. It produces many generation haploid cells. I. Haplobiontic: In this case, the vegetative cells are haploid. Only zygtte is diploid. 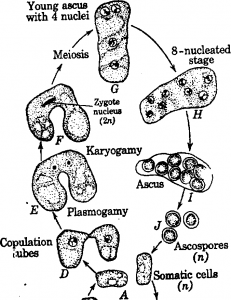 Zygote undergoes meiosis and form haploid ascospores. They reproduce asexually by fission. It is found in Sacc haromyces octosporus. Haplo–diplobiontic: In this case, two distinct phases are presentFig: Sexual reproductionGermination of ascospore: Each ascospore acts as vegetative cell. It reproduces asexually by budding. It produces many generation haploid cells. Haplo–diplobiontic: In this case, two distinct phases are present during life cycle. These phases are haplophase and diplophase. Both reproduce by budding. Two haploid cells fuse to form diploid cells. The diploid cell undergoes meiosis and form haploid cells.